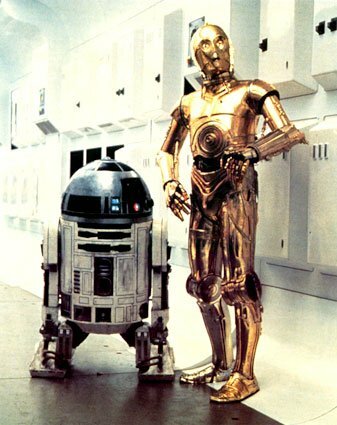 R2-D2 and C-3PO are best friends. They grew up together, went to the same college and for the past few weeks, they’ve been working on a story together. A friend of a friend of C-3PO’s is an editor and, based on R2 and 3PO’s happy hour accentuated pitch, has agreed to take a look at it. Unfortunately, the story isn’t done; it’s still in pre-first draft form. R2’s been dragging his feet finalizing the plot structure. He promised to have the final outline to him this morning, but 3PO hasn’t heard from him. They hung out last night, but every time 3PO brought the story up R2 told him to chill out. Friend-of-a-friend Editor needs a copy of the story by the end of the week or she won’t have time to look at it. 3PO is frustrated and angry at R2. This could be a big break for him and he doesn’t understand why his best friend is being so difficult to work with. Negotiating jobs with strangers or people you only deal with in the business world is one thing. Those people disappear into the ether at quitting time, they will not be at dinner tonight, at the BBQ this weekend or at your birthday party next month. Friends are a different story. Your friends, we hope, are going to be around for a long, long time. A botched business deal or contractual miscommunication isn’t worth losing a friendship. A friendship also shouldn’t jeopardize your career. Working with friends can be both wonderful and complicated. How a particular deal with a particular friend works out depends on how you approach it. I’ve put together an approach that’s a good starting point if you’re creating something with a friend. Sit down and go through this post together. Take the time and really consider the questions; be honest with one another about your answers. Doing this now, instead of later, means you have all of the benefits of your friendship to help get you through the difficult parts. Prior to your first face to face negotiation about the job, write out your expectations, goals and assumptions about the job. This doesn’t have to be a long treatise or anything; a simple paragraph or two is fine. The important thing is that you take some time to write these things out. They’re all locked up in your head right now and, despite how fantastic your friend is, neither of you are mind readers. Put down your thoughts on paper and then, when you meet, trade. Read through what your friend has written. Does their vision match yours? Probably not 100%, maybe not even 60%. Whatever it is, it’s OK. The point right now is to literally get on the same page. Use the summaries you’ve both written to hack out the basics of what you’re doing. If you notice you’re both using similar language in your summaries, make sure you mean the same thing when using that language. This will be your guiding document throughout the project. When there are questions about what to do or if this is what y’all originally intended, you’re going to come back and look at this document. If the project changes, you can keep track of those changes here. This isn’t a contract or a statement of work. If you decide that’s important, you should talk to a lawyer and have one drawn up. The point of the summary you’re creating together is to make sure you agree about what the project is, why you’re doing it and how you’re going to accomplish it. Step Two: This is going to be difficult. If you’re creating something together, you’ll eventually have to talk about money. Or a missed deadline. Or someone not living up to their end of the bargain because they are hungover from spending too much time at the bar last night trying to score the redhead’s number. Don’t wait. Do it now. Talk about the hard stuff. One of the difficult things about working with friends is that when it comes time to have a difficult conversation there’s a whole heck of a lot more on the line than just the job. And if their personal life is impacting the job, there is no crystal clear line between the job and your friendship. Especially if the redhead is involved. So don’t wait until something upsetting happens and you’re both frustrated and annoyed. Right now there’s nothing on the line, no one’s missed a deadline or owes the other money. Use this time when you’re both calm and happy to talk about your expectations of one another, your work pet peeves and how you like to deal with conflict. What you expect you’ll be doing on the project. What you expect your friend will be doing on the project. How you expect to split fees, sales or other income from the project. How you expect to get paid. How you like to communicate when working (email, phone, face-to-face). Your top three pet peeves when working with other people. The things you found most frustrating in your last three jobs. How you react when there is conflict. Be honest with one another and listen to what your friend tells you. If you have a question about anything they tell you, ask. Be patient and direct answering any questions they may have of you. Now that you’ve talked about the difficult stuff, talk about how you’ll deal with it when it comes up. Instead of hoping and wishing that everything will be nice and smooth, write up a short list of ground rules for when things get bumpy. Does one of you hide behind email when conflicts arise? Make a rule that if you’ve exchanged three emails on a topic and it’s not resolved, you’ll meet for coffee to hash it out. Is one of you better at talking with clients? Make a rule that that person is the official point of contact. Do you have a weekly dinner get-together with other friends? Make a rule to not talk about any conflicts you may have with one another at the dinner. Are timelines important in this job? Make a rule that if one of you misses a deadline you will publicly declare your belief that Chris Pine is the superior James T. Kirk. If during the job you notice that your friend isn’t sticking to the ground rules, call her on it. “We said we’d deal with emails from our editor this way. You didn’t do that. Why?” The rules will help you have conversations about difficult topics. They might not make those conversations completely delightful, but they will make them easier to have. All of these conversations are designed to help you find the right balance between your relationship and the work you’ll do together. It might seem silly talking to your best friend of 10 years about how he likes to communicate, but it’ll feel worse if a miscommunication about work harms that relationship. Talking about these things upfront can help you make sure that doesn’t happen. Thanks for the post! Very informative and helpful. And thank you for the comment! It’s always nice to hear when a post is helpful for someone.